Day 28: The leaves have fallen, and it’s chilly outside! 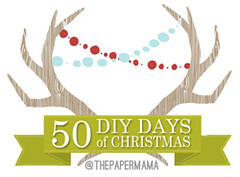 Time to get cozy inside with some more DIY projects. 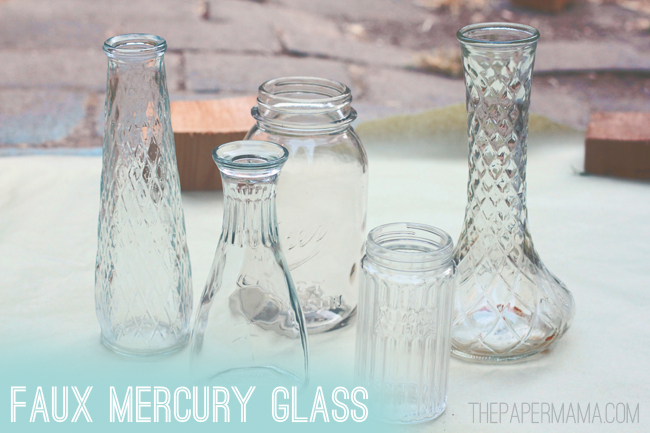 Today I’m sharing how you can create some very pretty faux mercury glassware! Yup, all those pretty/aged candles and vases you find in the shops for $30+ can now be made for a few bucks. Yeeeessss. The past year I’ve seen SO many different tutorials for homemade faux glassware, but I hadn’t seen any DIY’s that you can actually turn into a vase (the usual tutorial sprays paint INSIDE of the glassware). I wanted to actually use my vases to hold flowers, so I tried something… Instead of spraying the paint inside the glassware, I sprayed it on the OUTside. It turned out lovely! Here’s how I did it. – Glassware. 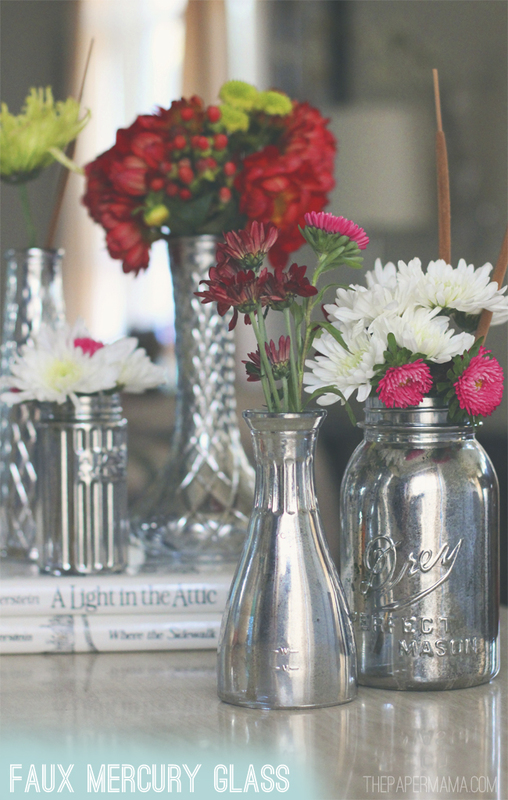 You know you have some lying around… an old glass vase, jar, or even an old glass container. If you can’t find anything, head to your local thrift store. You can find SO much discarded glassware for a few cents or dollars. 1. Clean and completely dry your glassware. 2. Get your tools all ready: Put your vinegar + water mixture into the spray bottle, set the nozzle to the lightest mist setting possible. Lay down your drop cloth (outside or in a very well ventilated space), and set your glassware up. Get your gloves, mask, and beautiful goggles on. Have your paper towels nearby… ok, let’s do this! 3. Spray a layer of the mirrored paint on the outside of a glass. Follow this with a light spritz of the vinegar + water mixture. Let that sit for 2 – 4 minutes. 4. When your wait time is up, dab the vinegar + water mixture off of the glass. DON’T rub. That will smudge the paint. Just a light dab. 5. Repeat steps 3 and 4 until you’re happy with how the glass looks! I added about 4 layers of mirror glass to each piece (each layer was followed by a spritz of vinegar + water and then dabs). 6. Let the paint dry for 24 hours. 7. Add a beautiful bouquet of flowers to your vase! Or, turn those beauties into a candle holder. Give them as gifts! Enjoy. Is there a difference between looking glass regular and looking glass sliver? Hmmm… I’m not sure. Maybe if you head into a craft store they might be able to help? I feel like the regular might be less shiny. Maybe. Good luck! I do believe this technique can solve a big problem for me…glass panes on french doors between private areas in a bed and breakfast that can also be adjoined areas. Other solutions have failed…etching does not give enough privacy, contact paper gets peeled off (by curious kids?). My only question before I give it a try is how to keep it clean. Can you recommend a finish that can help the treated glass hold up to regular cleaning? Hmmm… I usually use and clear acrylic sealing spray to seal projects, but I haven't tried it on this. Maybe try a test spot? Very pretty! Thank you for sharing the technique! So awesome! Love this little trick and it looks phenomenal! 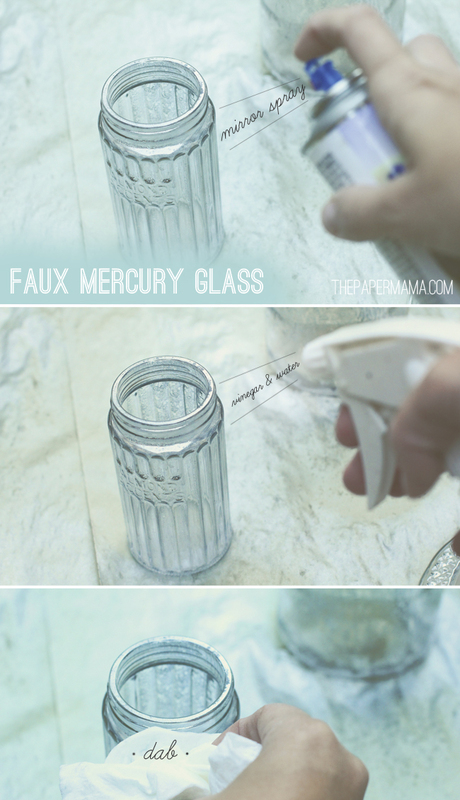 Ooh, I love mercury glass- I'll be pinning this tutorial!! These turned out fantastic!! I love them!! Thanks for the tutorial … I'm totally doing this!! I love mercury glass. I'm So doing this. I have a small collection of mercury glass that I LOVE to work into all my seasonal decorating but it's the best at christmas! I tried the spray inside the glass technique a few years ago and I hated how it turned out. YAY for new ideas!